Links to purchase the print or ebook of Alexander Hamilton: The Formative Years. Even though Alexander Hamilton was among the most important Founding Fathers, less is known about his early life than that of any other major Founder. Relatively few records have been found regarding Hamilton’s birth, childhood, and origins in the West Indies. Alexander Hamilton “rarely . . . dwelt upon his personal history” and never recorded his life’s story. Most of Hamilton’s correspondence prior to 1777 was lost during the American Revolution. This has resulted in many gaps in Alexander Hamilton’s biography, which has given rise to much conjecture regarding the details of his life. Relying on new research and extensive analysis of the existing literature, Michael E. Newton presents a more comprehensive and accurate account of Alexander Hamilton’s formative years. Despite being orphaned as a young boy and having his birth be “the subject of the most humiliating criticism,” Alexander Hamilton used his intelligence, determination, and charisma to overcome his questionable origins and desperate situation. Hamilton worked for a mercantile company on St. Croix, moved to the mainland, penned political pamphlets, enlisted in the militia, commanded an artillery company, served as General Washington’s “principal and most confidential aid” for four years, was given command of a battalion of light troops, and led the assault on Redoubt Ten at Yorktown. Thus, by the age of just twenty-five, Alexander Hamilton had proven himself to be one of the most intelligent, brave, hard-working, and patriotic Americans. Alexander Hamilton: The Formative Years tells the dramatic story of how this poor immigrant emerged from obscurity and transformed himself into the most remarkable Founding Father. In riveting detail, Michael E. Newton delivers a fresh and fascinating account of Alexander Hamilton’s origins, youth, and indispensable services during the American Revolution. 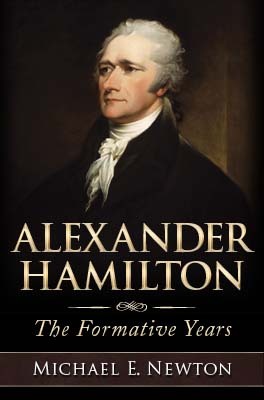 A comprehensive and thoroughly researched tool to promote the true early life of Alexander Hamilton. . . . A most exciting historiography of Alexander Hamilton. The most detailed examination of Hamilton’s early life that I have ever read. . . . This is an invaluable resource, a must have, for serious scholars and students who are interested in the life of Alexander Hamilton. Michael E. Newton’s Alexander Hamilton: The Formative Years represents a significant scholarly contribution to the literature regarding the first half of Alexander Hamilton’s remarkable life story and to our understanding of the American Revolution. . . Mr. Newton’s scholarly findings regarding Hamilton’s origins, youth, and service in the American Revolution surpass every book that has preceded it. A painstakingly researched and carefully documented biography of the most remarkable of our Founding Fathers. Hamilton’s life story is . . . deserving of the meticulous attention to detail that Michael E. Newton’s work will provide for generations of Americans. It is a pleasure to read such a deep, informed, and scrupulously documented volume, yet one that is so engaging and well written as to be something of a page-turner. Click here for a partial list of new discoveries to be found in Alexander Hamilton: The Formative Years. Click here to see the full cover. Click here to purchase a print or ebook copy. Previews of the hardcover book are available at Amazon.com and Google Books.